Trouble is brewing in South Town. After witnessing a mob hit, Ryo and his friend Robert are marked men. It didn't seem to sink in, however, until they realized Yuri (Ryo's sister) was missing. Now they're going to get even! 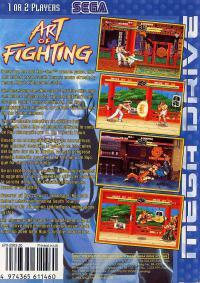 Art of Fighting is a translation of SNK's 1992 arcade fighting game. Choose either Ryo Sakazaki or Robert Garcia and challenge eight characters on your way to fight syndicate boss Mr. Big. Art of Fighting differs from most games in the genre by offering a one-player Story Mode, where cinema style cut-scenes further the story as you learn more about Yuri's whereabouts. Also notable is that players receive special move "hints" after each match. 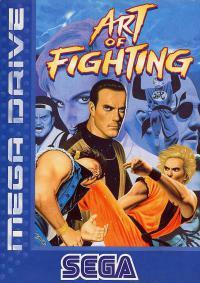 The two-player Versus Mode allows players to choose from a total of ten characters: Ryo, Robert, Mr. Big, Karate, Lee Pai Long, Mickey Rodgers, John Crawley, King, Jack Turner, or Todo Ryuhaku.